Val and Bill Norrington are professional leatherworkers who established their first studio in North Wales, UK, in 1972. Val was born in Wrexham, Wales, and was a graduate of History at the University of Birmingham. In 1971, Val received a grant to pursue a further degree at the University of California, Berkeley. En route, she stopped off in Santa Barbara and met Bill, an American UCSB teaching assistant who was working on his Ph.D. in English. 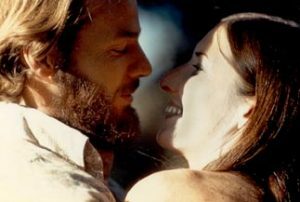 The marriage ceremony was performed on a Santa Barbara beach in 1972, and they “eloped” to North Wales and the world of crafts the same year. “Candles in the Rain” was registered as their official business name in 1972 because they originally made candles to make ends meet, and because it sure rains in Wales! They worked with a variety of art/craft media for several years but ended up specializing in leatherwork from 1977 on. 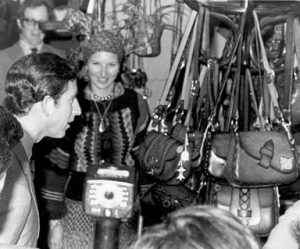 While in Wales, they supplied Heals and Liberty’s of London, exported to several countries, were the subject of a BBC television documentary, were featured by leading UK fashion magazines, and had the honor of being complimented on their leatherwork by the Prince of Wales (Welsh Fair, 1979). The partnership is indebted to numerous UK organizations for supporting their fledgling efforts: The Council for Small Industries in Rural Areas (CoSIRA) for a loan towards the purchase of their original house and workshop in 1972; the Welsh Development Agency for a grant towards a new workshop in 1974; the Welsh Arts Council for a grant towards hiring an apprentice in 1976; the Welsh Tourist Board for a grant enabling them to exhibit in Berlin, West Germany for the 1979 “Welsh Week”; and the British Arts Council for a grant enabling them to represent the British Association of Designer Leatherworkers at the international “Leatherworks” conference in Adelaide, Australia, 1985. In 1989 Val & Bill came full circle and moved back to Santa Barbara where they continue to challenge stereotypes concerning leather. Their latest work is primarily concerned with the sculptural nature of leather as a medium of artistic expression. Since 1983, they have been experimenting with “cuir bouilli” (Old French for “boiled leather”), a process of molding and hardening leather that dates back to the 13th century in terms of written references. The process was never spelled out, because medieval guilds were extremely secretive about their specific “recipes”–but it seems to have involved the use of boiling water and/or oil, and it was used to make everything from leather armor and cannon barrels to plates and “bottles” (as Shakespeare referred to them). Today, the technique is virtually unheard of, the only vestiges being the traditional use of water to soften leather so that it can be shaped or “lasted” by a saddler, shoemaker, or casemaker. Val and Bill have taken traditional water forming a step forward by going back to what “cuir bouilli” used to achieve–by using old fashioned boiling water and a modern blowtorch, they can not only mold the leather but can make it permanently hard as well. All of their work is created in this manner, and each piece is “freeform,” i.e., each piece is individually molded by hand without the aid of a machine or prefabricated mold. And each piece is designed and made by them, alone. Their use of color is also unorthodox. They combine traditional leather stains with modern acrylic pigments, they often overlay the two, and they enjoy experimenting with new color products. Most of the dyeing is done with an airbrush, but special effects are achieved by using everything from sponges and paintbrushes to “resist’ and stencil techniques. Each piece is also given four coats of clear acrylic finish that is both water resistant and non-toxic (their bowls are ideal for anything from candy and crackers to potpourri and peanuts, their coasters will not be affected by water, and their wall pieces and garlands are easily cleaned with a damp cloth and/or vacuum cleaner). The leather they use is top grain, natural cowhide that is processed from what would otherwise be a waste product of the beef industry. They only use American leather, and they pay top dollar for premium hides because they know that quality materials translate into quality products. Leather is a material that is not often thought of in terms of sculpture, but it is a medium that is “plastic,” lightweight, durable, and ideally suited for use in three-dimensional work. Val and Bill hope that their original leather creations will not only dispel some of the modern stereotypes about leather, but will also encourage others to experiment with this versatile material that has been utilized by mankind since its inception. Their work is currently available in fine galleries and craft stores throughout the USA; commissions and orders are taken by appointment or via sales representatives only. The business name is still “Candles in the Rain,” and the honeymoon is far from over! “Candles in the Rain” is the name of a song that a lady named Melanie sang at the opening of the first Woodstock Festival in the 60’s. It begins with a lot of soulful and warbling sound effects, moves into folk rap, and then, finally, explodes into an ecstasy of hippie-rock. I can now mock Melanie, but I still like her first big hit. If that doesn’t make any sense to you, you are either too old or too young. And I’m not being critical, because I wasn’t at the original Woodstock either. “Raise the candles high…to stay dry against the rain…Some came to sing, some came to pray, some came to keep the dark away…” No matter what you think of the sound, Melanie vocalized a message which summed up an era. It was “us” against “them,” light against dark, idealistic youth against the tyranny of the establishment. We were the new generation, we had a chance! “Candles in the Rain” was a song about idealism, faith, and revolution, about creating a flicker of moral light in the darkness of universal decadence. Before I met my wife, I shared a student apartment near a California campus with a guy who turned out to be an acid freak and was into mysticism. He introduced me to Melanie’s song. What he particularly liked about it was a reference in the song to Meher Baba. Meher Baba was an Indian mystic who promised to reveal the “truth” on his deathbed, but refused to speak in the meantime (literally–he never spoke, not even on his deathbed). I never figured out how Meher Baba got his message out so successfully, but he had a serious following at the time. Melanie’s song was also about things that had no hope of realization, unless people believed in them enough. Like peace, like Meyer Baba finally speaking, like candles surviving in the rain. We arrived on the doorstep of Val’s parents in North Wales with no money, no realistic job prospects, and no real worries. After all, we were on our honeymoon, young, in love, and had both been to college. But, when a dozen academic job applications on my part went unanswered, Val took matters into her own fair hands and made a few sand candles in her parents’ tiny back yard. We took our candles to a local tourist trap, timidly showed them to the buyer of the first shop we came to, and were stunned when we not only sold all we had but were also given our first ever order for more! Who could resist such a lure? Getting paid for having fun, getting orders for unforeseen fun, and not having to worry about a salaried job was a prospect that few people our age were ever offered. We took the bait, gladly. We made our first commercial candles in an outdoor sandbox in North Wales. And it rains a lot in Wales. And Melanie’s song still rang in our heads. We chose “Candles in the Rain” as a business name, because it linked our past with our present, it combined literal meaning with allusion, and it summed up our aspirations. Val and I made candles in North Wales for five years. 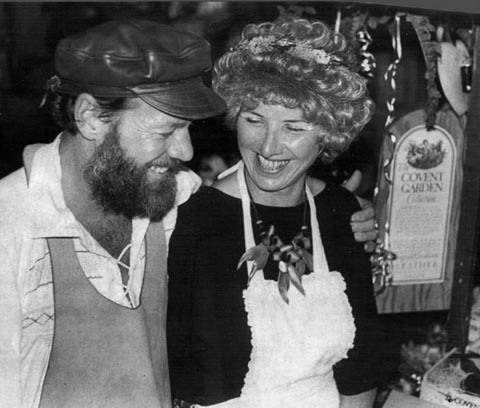 We were the first sand candle makers in all of the UK in the early 70s, and we made a lot of money. And we gave it all up without regret. The rot began when we first approached the big suppliers and makers for both materials and advice. One senior salesman seriously advised us to buy premises that we didn’t really want and then to have a “convenient fire”–the insurance would cover it and allow us to go wherever we wanted. After all, that’s what his company had done. And what candle making operation has not had a fire? We were horrified. Not only could we not conceive of committing fraud or arson, particularly in or on premises that we dearly loved, but Val was terrified of fire. “Candles in the Rain” specialized in candles that were carved, layered, and unusually shaped–all things that mass producers had little time for. Our specialty was sand candles that the big boys wouldn’t touch. We made two tier “owl” candles, we carved Celtic designs, we hand dipped mushroom shapes, we made our own molds, and we became clever at recycling waste into high ticket, one-off designs. The backyard business grew into a serious production unit with thermostatically controlled wax tanks, two ton deliveries of wax each month, industrial propane tanks, and up to 6 employees. Hey! We were making money! But we both became unhappy. Between the employees and the volume of orders, we found ourselves working one hundred hour weeks, overloaded with paperwork which had more to do with the workers than our actual hands-on business, and increasingly worried about what that scumbag salesman had originally hinted at–fire. So, with the perverse logic that only an artist/craftsperson can defend, we phased out candle making in favor of leatherwork. 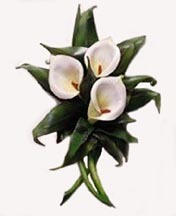 After all, Val had been a tailoress and was good at design, Bill was fairly good at tooling and carving leather, and leatherwork was a lot more challenging than candle making. We began with a range of belts and handbags that were cut, decorated, dyed, finished, and assembled entirely by hand. Our first primitive efforts were so incredibly successful on a commercial level that we dropped candle making entirely. But the horses we changed in midstream were not all that different. Making belts by hand is no more exciting than making candles by hand, and aniline dyes and leather finishes pose a long term health risk which certainly rivals the immediate risks inherent in candle making. Of course, it took us a long time to discover all this, never mind acknowledge it. The real difference was the material itself–and the challenge it presented. We were woefully ignorant about our chosen material when we took up leatherwork. We liked it because of its age-old tradition, because it was about as “natural” as you could get (after clay and wood), and because it was durable. And the challenge of learning about tanning, currying, dyeing, finishing, and working leather was an added incentive, from our innocent perspective. The first major change which we, as neophyte leatherworkers, noticed was that the cost of our raw materials was a lot higher than those involved in candle making. Worse still, the raw materials varied greatly in quality, price, and consistency of supply. The second major shock was the discovery that mass production techniques offered a serious alternative to our meticulously hand-made efforts. But we believed that the public would appreciate, and pay for, the difference between machine embossing and hand carving, between machine sewing and saddle stitching. We believed that until, like John Henry, we nearly died with our tools in our hands. By the mid 80’s, Val and I were at our wits end trying to survive off leatherwork, trying to defy recession. We had experimented with almost every traditional leather work technique and had even come up with some new ones. We represented British leatherwork at an international conference in Australia, we were featured twice in a leading fashion magazine, we exhibited our work in Holland and Germany, and our work was included in a major Welsh Arts Council exhibition. But you can’t live on applause. In 1986, Val put her foot down and announced that she would rather be poor and warm than poor and cold. We moved back to California the following year. It was, after all, Val’s turn to live in an exotic, foreign country. Once again, I submitted academic job applications with no success. Perhaps my lack of references as a self-employed person was the problem, perhaps I shouldn’t have mentioned fourteen years of being a leatherworker in North Wales. I decided to opt for local expertise and sent my resume to a professional for rewriting and tailoring. When my polished resume came back with “Wales” spelt as “Whales,” I put my foot down along side of Val’s, and “Candles in the Rain” went back into business on its own out of sheer defiance. What irritated us was the fact that most Americans had heard of Wales, but didn’t know where it was, never mind how to spell it. But we knew and could never forget. Candles in the rain.